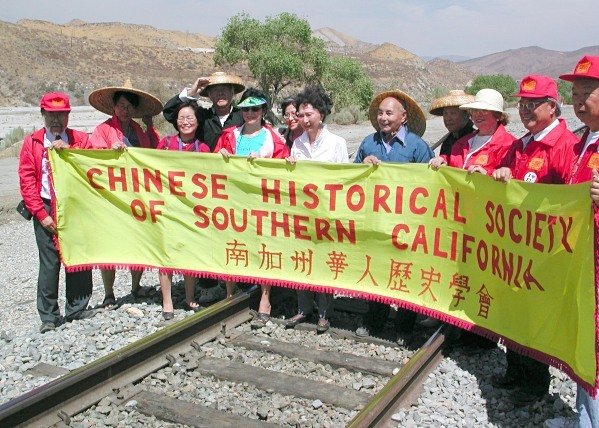 Members of the Chinese Historical Society of Southern California gather on the historic rails in front of Lang Station. At center is former Secretary of State March Fong Eu. Organized by Metrolink at the site of the former Lang Station, the quasquicentennial (125th anniversary) celebration of the "joining of the rails" with a golden spike on Sept. 5, 2001, included representatives of the Chinese Historical Society of Southern California, the Santa Clarita Valley Historical Society and the State Rail Museum, among others. Former California Secretary of State March Fong Eu, who was the ranking official at the centennial celebration in 1976, gave the keynote address, extolling the labors and sacrifices of 3,000 Chinese immigrants who united California and connected Los Angeles with the world. Lang Station itself, located 1/4 mile east of today's state Route 14 at Shadow Pines, was dedicated as California Historic Landmark No. 590 in 1957 and was torn down in 1971 after the Southern Pacific Railroad eliminated passenger service.